X-Factor started off with sincere intentions. 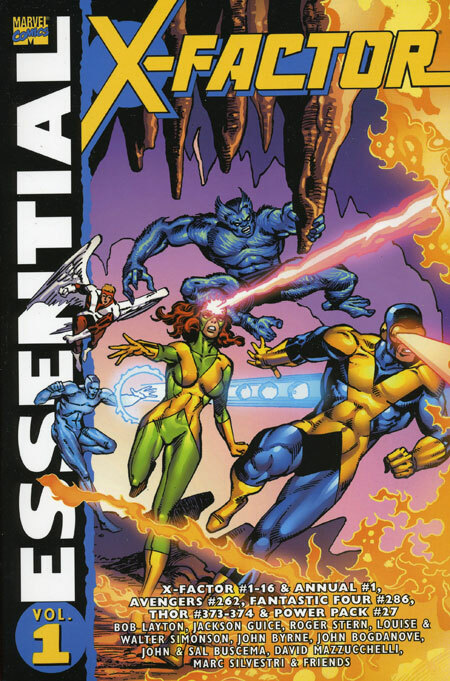 The team did find mutants unable to control their powers, and a cast of characters developed around the X-Factor team. But once you’ve been an X-Man, you are an X-Man for life, which means you get sucked into what ever ongoing storyline is occurring in Uncanny X-Men. Like a Phoenix Rising from the Ashes: Let’s flashback to Uncanny X-Men #137 (See Essential X-Men Vol. 2). The X-Men are battling the Imperial Guard for the life of Jean Grey, who is controlled by the Phoenix force. In her last moment of clarity, Jean professes her love to Scott (Cyclops) Summers, and then commits suicide. Or did she????? If you like this volume, try: the All-New X-Men series by Brian Michael Bendis and Stuart Immonen. As part of the Marvel Now campaign which launched several years ago, All-New X-Men brings the original X-Men team (circa Uncanny X-Men #9) from the past to the current day, in an attempt to make them aware of what their future would look like and try to get them to change. The original team is shocked by how their lives have played out, but choose to stay in the modern times to find out more. This is the perfect jumping on book for anyone afraid of how large the X-Universe has become, because the reader shares many of the same questions as the original X-Men. This is still an ongoing title, and the early issues have been collected in multiple trade paperbacks and hardcovers. This entry was posted in Marvel Essentials, X-Factor and tagged Bob Layton, Jackson Guice, John Buscema, John Byrne, Louise Simonson, Roger Stern, Sal Buscema, Walt Simonson, X-Factor, X-Men. Bookmark the permalink.